DURING THE campaign for America’s mid-term elections last year, Republican candidates warned that Democrats would try to impeach Donald Trump if they won control of the House of Representatives. Despite a few vows from some strident left-wingers, the new Democratic majority in the lower chamber has shown little appetite for trying to remove the president. Their leaders have preached patience while Robert Mueller, the special counsel, continues his investigation of Mr Trump’s activities related to Russia. article alleging that Donald Trump directed Michael Cohen, his former personal lawyer, to lie to Congress about Mr Trump’s plans to meet with Vladimir Putin, Russia’s president, in 2016 to discuss the development of a luxury hotel. 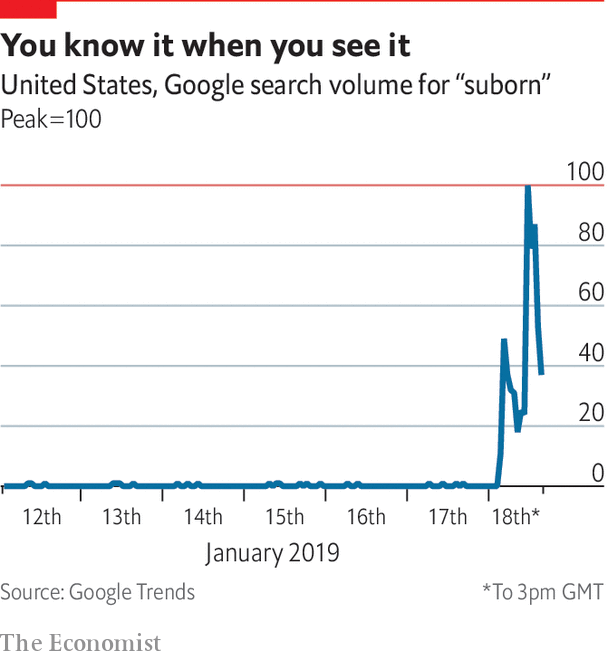 “Suborning” perjury—a legal term for which searches on Google have spiked since the story broke—is a crime punishable by up to five years in prison. BuzzFeed’s claims have not yet been confirmed by other news outlets, and one of the article’s authors has conceded that he has not personally seen any of the documents that would back up the allegation. Even if such evidence does emerge, longstanding Justice Department guidelines prohibit the indictment of a sitting president. The greatest threat the story presents to Mr Trump is that if enough members of Congress believe he induced Mr Cohen to lie to them, they might be more inclined to remove the president from office. In the wake of BuzzFeed’s story, participants in political betting markets now think it is more likely than not that the House will vote to put Mr Trump on trial. 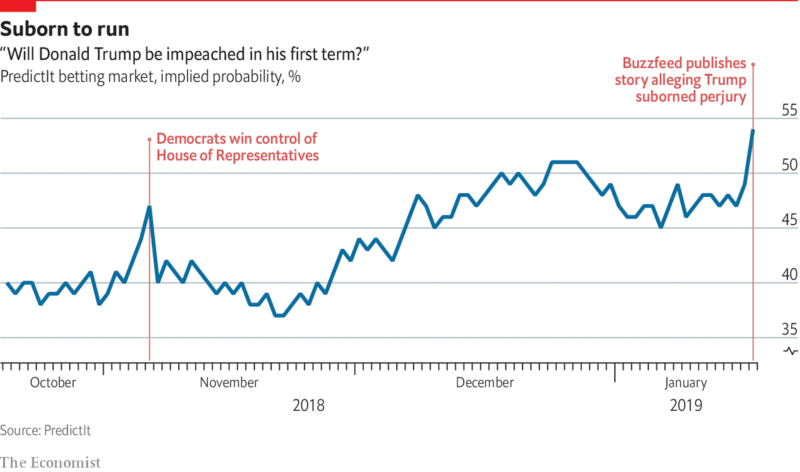 Before the news broke, traders collectively assigned a 47% probability to a successful impeachment vote during Mr Trump’s first term. Afterwards, this figure surged to 59%, on the highest volume of transactions since the mid-term elections. Nonetheless, an impeachment in the House would hardly guarantee that Mr Trump will depart the White House early. Removing him from office would then require support from two-thirds of the Senate, where Democrats are in the minority. The president could also conceivably leave office by resigning or dying. But traders on PredictIt still think there is a 65% chance that Mr Trump will remain in his job for at least his full four years.